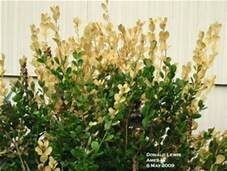 Is it Boxwood Blight or "just" Winter Burn? Spring is here, but the impact of winter is visible on many trees and shrubs in our area. Winter is tough for plants when temperatures are below freezing and drying winds are common. When evergreens and perennials are subjected to these conditions, the result is often browning leaves/needles. This is called Desiccation, which causes Winter Burn. 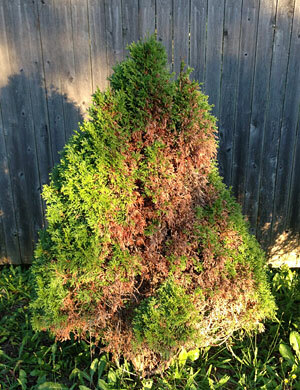 We’ll discuss Boxwood Blight, which is sometimes mistaken for Winter Burn, in our next blog post. When we talk about desiccation in plants, we’re specifically referring to the transfer of excessive amounts of water from leaves into the atmosphere. As a part of their normal respiratory functions, plants tend to release some moisture, but it’s usually not a problem since they’re also bringing in new fluids from their roots at the same time. Winter desiccation happens when the plant is rooted in frozen ground but is trying to continue its metabolic processes anyway, or when there’s an external force, like a very dry wind. The first scenario is a lot easier to manage than the second, but both are treated similarly. Once your plant is damaged by desiccation, there’s no going back – those brown tissues are just dead. But, you can take steps to protect your plant from further damage. Even though winter desiccation is the most dramatic, plants are at risk of desiccation all year long. Because desiccation is most common in newly transplanted trees and shrubs, or those that aren’t well established, it pays to spend some extra time and care on these plants. Start by putting your trees and shrubs on a watering schedule. Although they might not need water every week, make sure you’re giving plenty of water between rainstorms. The exact amount will depend on the size of your plant and its watering requirements, but lawn irrigation won’t be enough. Bigger plants need much more water – in the neighborhood of several inches every week. A properly hydrated tree or shrub is going to be able to hold out a lot longer against desiccating winds due to their extra supply of water. This is especially true as winter sets in again. Want more information on caring for your trees and shrubs? Talk with the experts at ProLawn. We’re here to help! Call us at 540.662.8316!